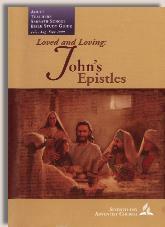 Commentary on introduction to "Loved and Loving: John's Epistles"
Given the title of this Quarterly, a word must be said about loving Seventh-day Adventists. This is the third series of lessons on which we have provided commentary for the Seventh-day Adventist Church Sabbath School Quarterly lessons. Some may question our intentions for writing these commentaries. Many of us are former Seventh-day Adventists, some are Christians who have never been SDA. Our primary intention in writing these commentaries is to provide Seventh-day Adventists with an approach to the content of the Sabbath School Quarterly that is Christian, without the overlay of a specific denominational understanding. We are from a variety of Christian churches with this distinctive: We believe that there is life in Jesus Christ and in no other, and we believe the historic doctrines of the Christian Church to be true. Some have accused us of being hateful and unloving toward Seventh-day Adventists. Nothing could be further from the truth. Recently Penn Jillette, of the famous Penn and Teller magic team, who is an avowed athiest said that he does not respect Christians who do not believe in proselytizing. He said that if you believe that heaven is real and you could go there, or that hell is real and you could go there, but do not proselytize, you are truly a mean and hateful person. When we challenge you to check what you are being taught against what the Bible teaches, we are doing the most loving thing we know. We are not against Seventh-day Adventists, we are against false teaching that is done the name of Jesus Christ. Many of us who have come out of Seventh-day Adventism consider it very loving that someone took the time to show us the error of our ways. We have been loved in a very unique way and we want to share that love with you. This is our purpose in providing these commentaries. That said, let's take a look at the introduction to this quarter. The introduction to the Quarterlies lessons is titled "What We Don't Know About"
This introduction is good in that it asks some very important questions that philosophers and religious people have been asking for aeons. It also provides an indication as to where the answers to these questions are found. The three questions that are asked are: How did we get here?, Why are we here?, and Where are we going? The answer that the world provides is accepted by many today. The answer provided by the world is that it doesn't matter. We can't know any absolutes. However, these three questions are not the all-important questions that many make them out to be. For Christians, the answer provided by the Quarterly is the correct answer -- in Jesus we find the answers to the most important questions. But it is precisely the Christians that no longer ask these questions – it is the unbeliever who does not know where they've come from, why they're here or where they are going. For the unbeliever, it is critical to provide the basis for belief in the Bible, where these questions can then be answered. The Quarterly refers to these three questions as “the most important questions.” The lessons this quarter will be dealing with specific issues that are addressed in the letters of John, not directly answering these three questions. For the believer, these three questions have already been answered and John's letters are dealing with different issues, issues the early Christian church faced. In this sense, the lessons this quarter really have nothing to do with the three questions that are posed here in the introduction. The three questions posed in the introduction to the lessons this quarter are not the important questions that believers are asking. These three questions are not the issues with which John's letters are dealing. Before applying the passages to our lives today, there are a number of other questions that the believer must answer. As you study John's letters this quarter, please ask the historical and theological questions first before attempting to apply the scripture. This will help avoid any faulty belief systems that only have the appearance of being founded upon scripture. We at Bible Studies for Adventists look forward to studying the lessons with you this quarter. 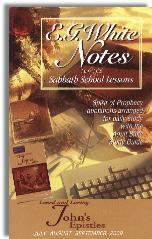 Copyright 2008–9 BibleStudiesForAdventists.com. All rights reserved. Revised July 10, 2009. This website is published by Life Assurance Ministries, Glendale, Arizona, USA, the publisher of Proclamation! Magazine. Contact email: BibleStudiesForAdventists@gmail.com.